Guringai speakers (some of whom called themselves by the clan names below) met the first fleet when it arrived in 1788 and they were the first Indigenous people in Australia to resist Phillip’s fleet. They inhabited the north shore of Sydney Harbour, living along the coast from Kirribilli then north to Manly up along the northern beaches to Broken Bay and as far as Wyong. Inland they extended to the Lane Cove River. The word for man or person is kuri (Koori) and kuringga, the possessive means ‘belonging to kuri’. Ngai (ng/guy) means ‘woman’. The name Guringai was coined by ethnographer John Fraser in 1892 as the original name of the tribal group was not known. 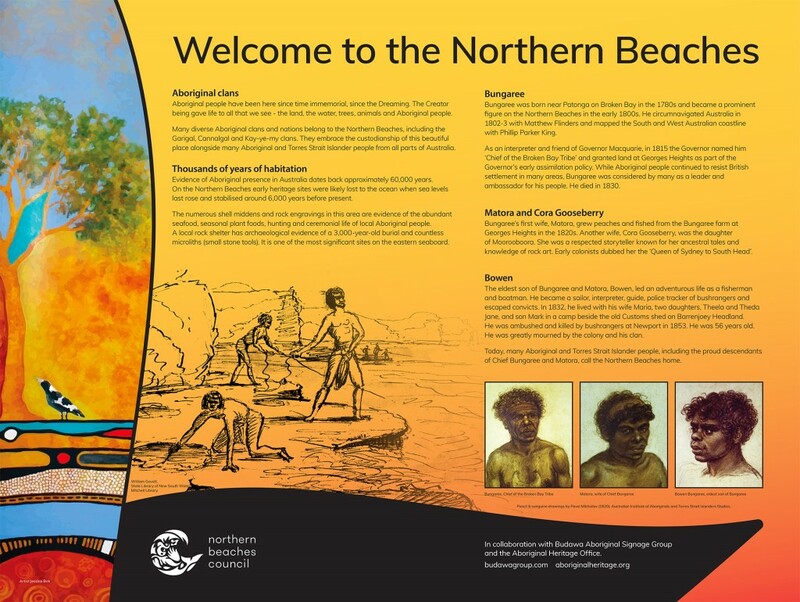 Within the language area were many tribal names such as Garigal, Gayamaygal, Gai-mariagal and Borogegal. Some of the clans in the Guringai speaking areas: Kayimai (Manly, harbour), Borogegal (Bradleys Head), Cannalgal (Manly, coast), Garigal (Broken Bay), Cammeragal (Cammeray).